Twitter has reinstated the account of a white nationalist think tank leader credited with coining the term "alt-right". The social network suspended Richard Spencer on 15 November. Since then, he was filmed shouting: "Hail Trump, hail our people, hail victory," at a meeting, prompting some audience members to raise their arms in Nazi-style salutes. A leading anti-racism campaigner has criticised Twitter's decision. The technology company told the BBC that Mr Spencer had been temporarily blocked for running multiple accounts and not - as had been speculated - for hate speech offences. "Our rules explicitly prohibit creating multiple accounts with overlapping uses," said a spokesman for the company. "When we temporarily suspend multiple accounts for this violation, the account owner can designate one account for reinstatement." He added that Mr Spencer's other accounts would remain blocked. Should the BBC use 'alt-right' or not? Mr Spencer is president of the white nationalist think tank the National Policy Institute. He has not commented about his reinstatement, beyond posting a Gif from the Terminator film alongside the words "I'm back". He had previously accused Twitter of "purging" him and others based on their views. These include support for the idea of "ethno-states" - nations whose citizens share a common ancestry. 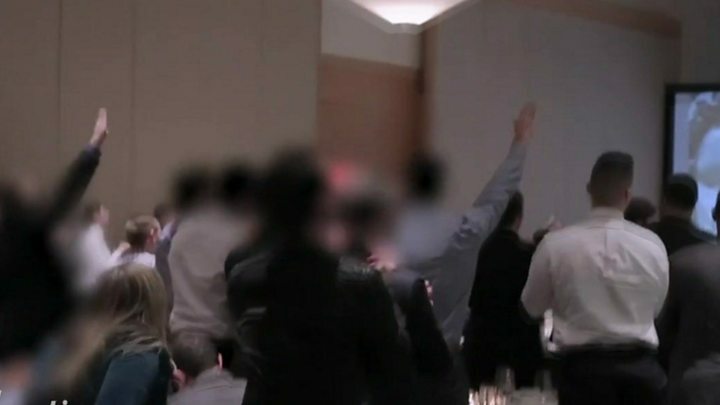 Mr Spencer has denied links to neo-Nazism, and defended his supporters' arm gestures at the filmed Washington DC event, saying they were "Roman salutes" given "in the spirit of ironic exuberance". But one critic has warned that his return to Twitter poses dangers. "He has access to hundreds of thousands of people and can poison minds, often those of young impressionable people," said Gerry Gable, founder of the anti-fascist Searchlight magazine. "If the the industry can't get together to put a stop to this, then governments have got to step in and take some action." Mr Spencer was banned from visiting the UK earlier this year by the then Home Secretary, Theresa May, who suggested his views would "foster hatred which might lead to inter-community violence". He has also been temporarily barred from visiting 26 other European countries, for taking part in an illegal meeting in Hungary in 2014. US President-elect Donald Trump has also voiced concern. When questioned about the alt-right meeting at which the salutes were given, Mr Trump said: "It is not a group I want to energise, and if they are energised I want to look into it and find out why... I condemn [them]. I disavow and condemn." Supporters of the alt-right movement differ on many points, but are generally outspoken in their attacks on multiculturalism, globalisation and immigration. Their targets also include what they see as political correctness and feminism. Steve Bannon - President-elect Donald Trump's chief strategist and former head of Breitbart News, which has covered the movement - defined it as "younger people who are anti-globalists, very nationalist, terribly anti-establishment". He added that it had "some racial and anti-Semitic overtones". The Associated Press news agency has expressed caution about using the designation. "The term may exist primarily as a public-relations device to make its supporters' actual beliefs less clear and more acceptable to a broader audience," its staff were told last month. "In the past, we have called such beliefs racist, neo-Nazi or white supremacist."